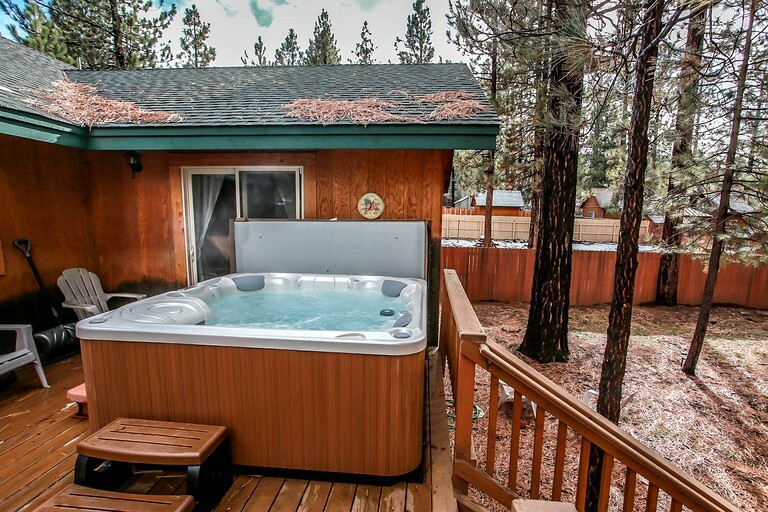 This beautiful cabin with a luxurious hot tub is located near the waters of Big Bear Lake, California, and can accommodate eight guests. 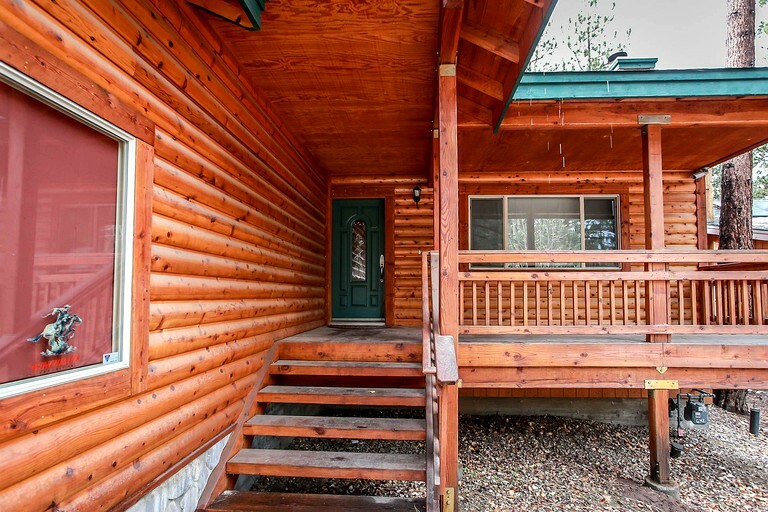 There are three comfortable bedrooms and two full bathrooms. 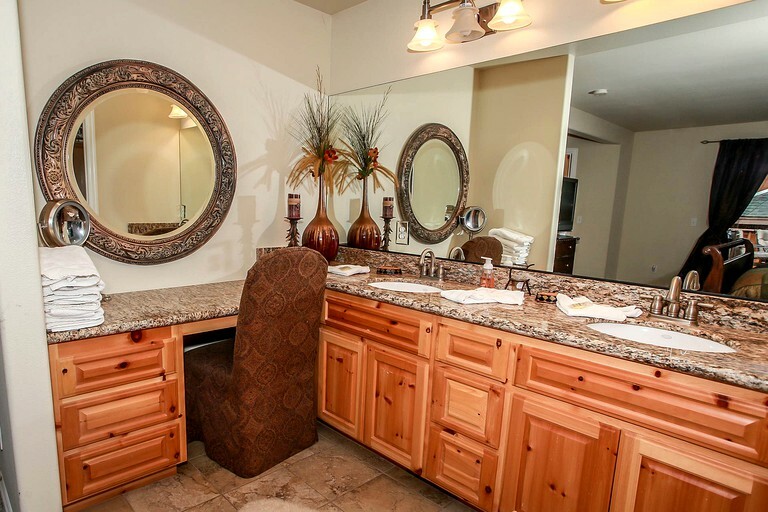 The master bedroom has a king-size bed and its own private bathroom that boasts a massive vanity with two sinks. 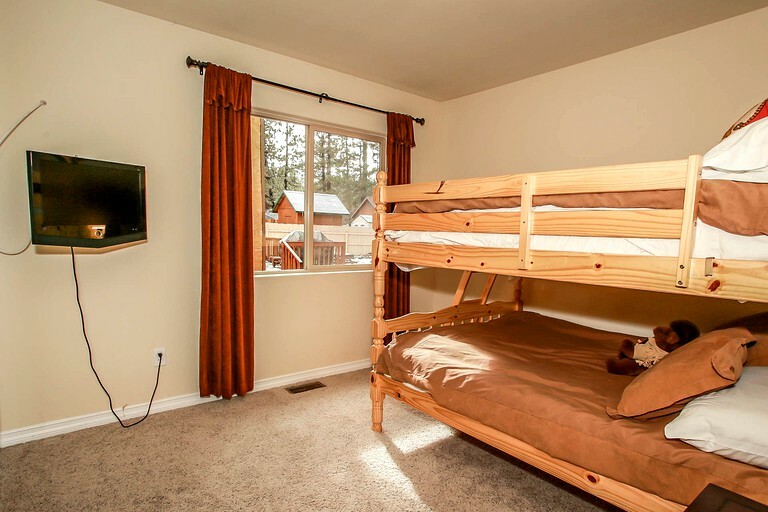 In the second bedroom, guests will find two full-size beds, while the third bedroom has a full-size bunk bed. 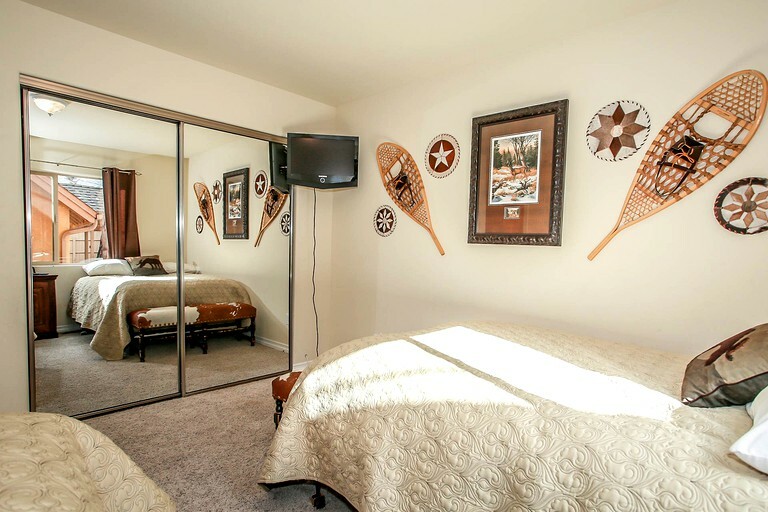 All three of the bedrooms come equipped with flatscreen televisions. 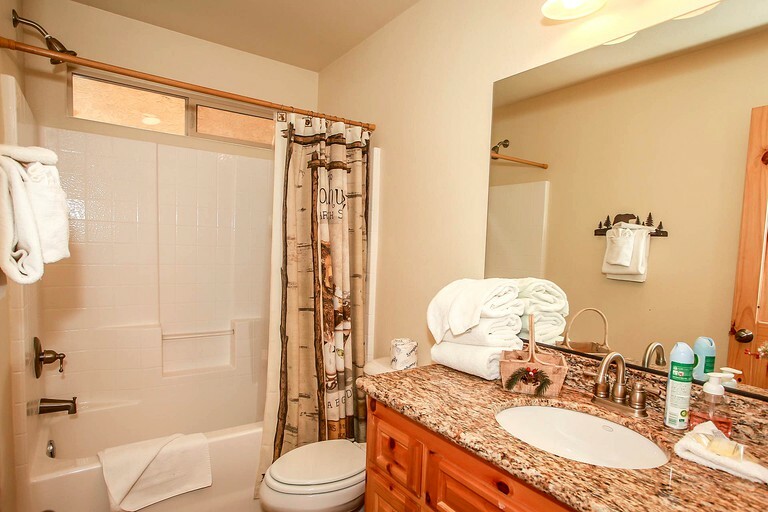 In the shared bathroom, there is a toilet, a sink, and a combination shower and bathtub. Linens and towels are provided. 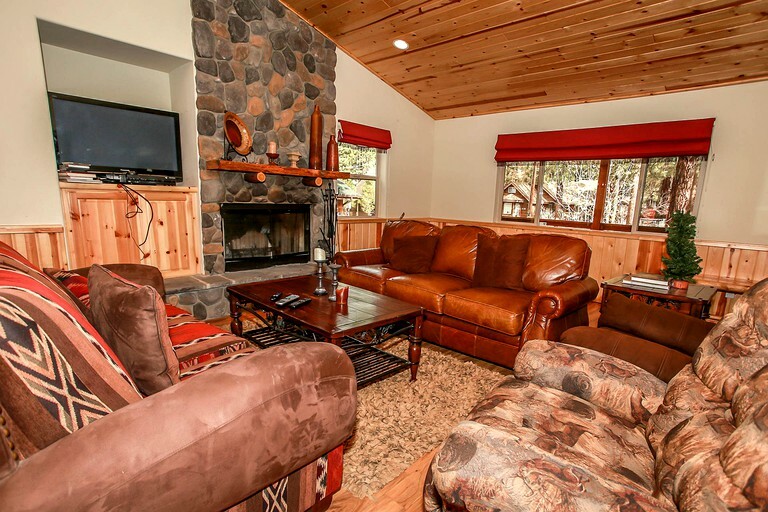 The living room is centered around the gorgeous fireplace, where guests will also find a flatscreen television, two sofas, and two cozy easy chairs around the coffee table. 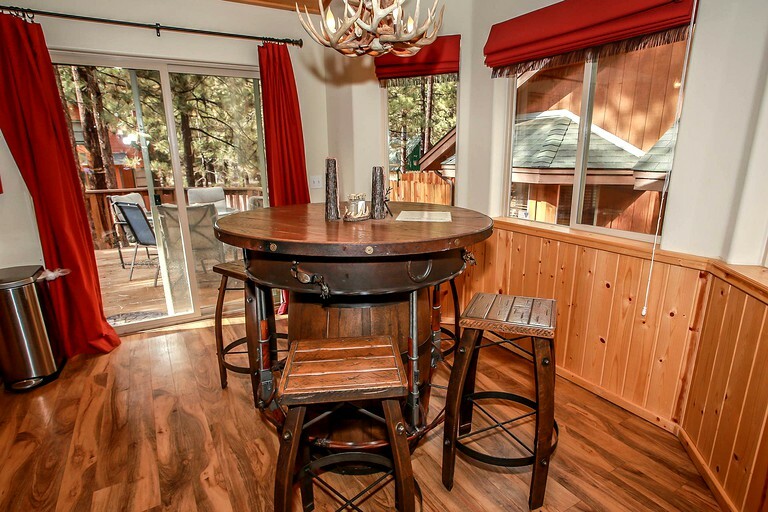 There is also plenty of seating at the round dining room table and the kitchen island. 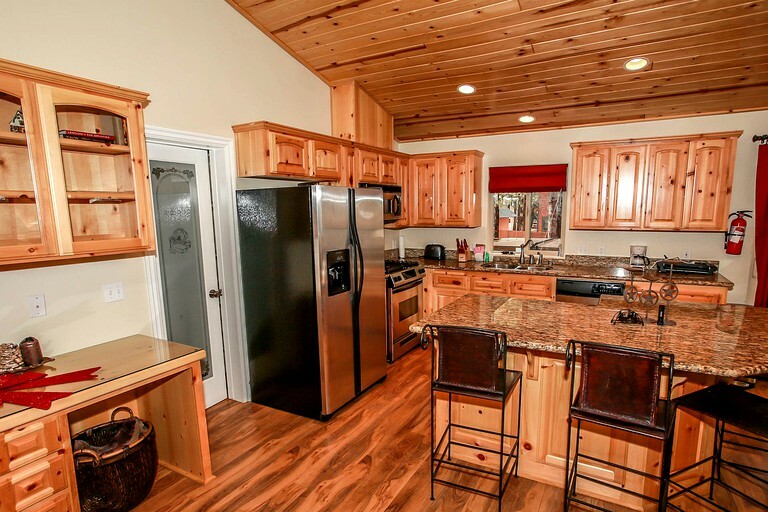 The fully-equipped kitchen comes with a stove, a refrigerator, an oven, a microwave, and a dishwasher. 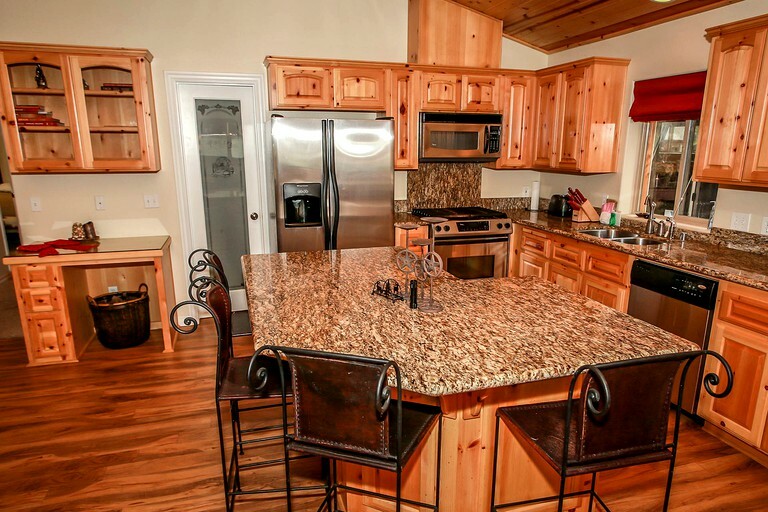 Other amenities include Wi-Fi, a washer and dryer, and central heat. 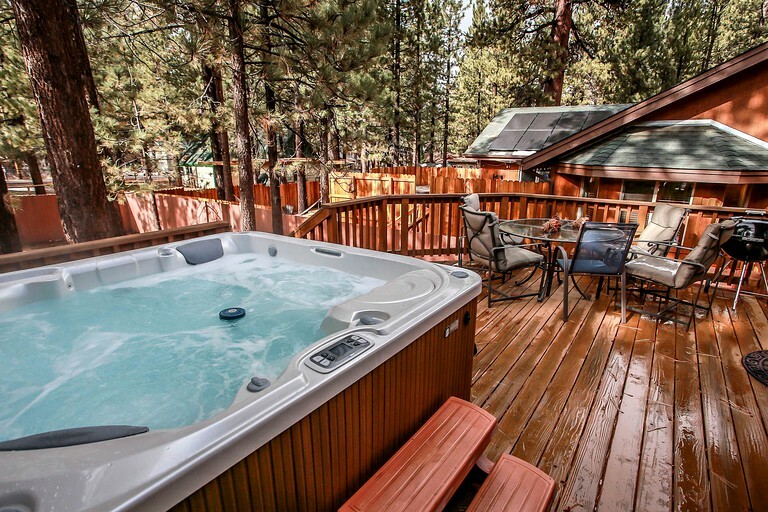 Guests of this lovely cabin will find respite from the chilled mountain air by soaking in the hot tub, laying in front of the wood-burning fireplace, or simply cranking up the central heat. 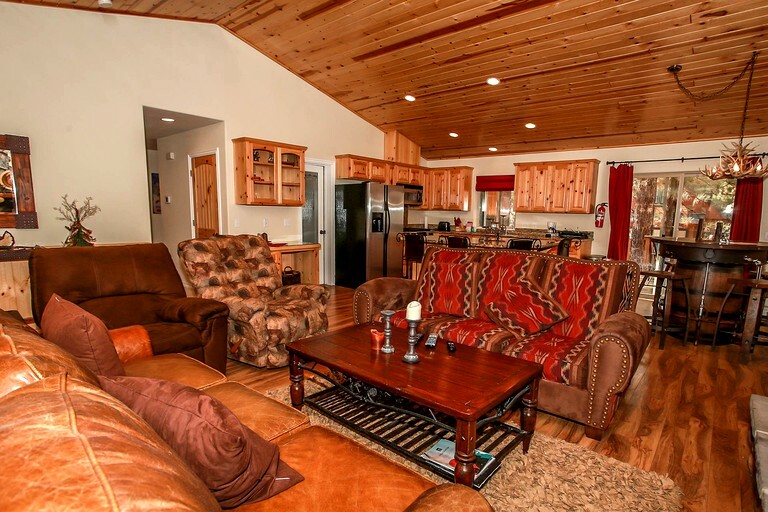 Wi-Fi is included, along with multiple televisions. 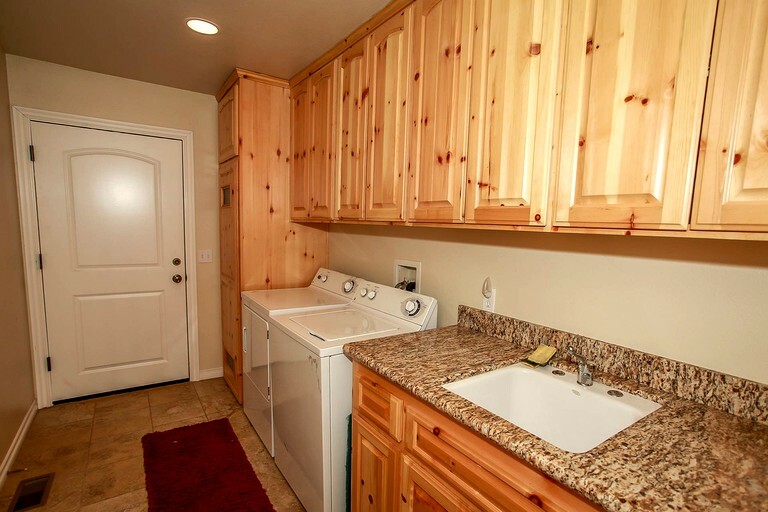 There is a large laundry room for when outdoor adventures get a little messy, and guests will love grilling on the barbeque. 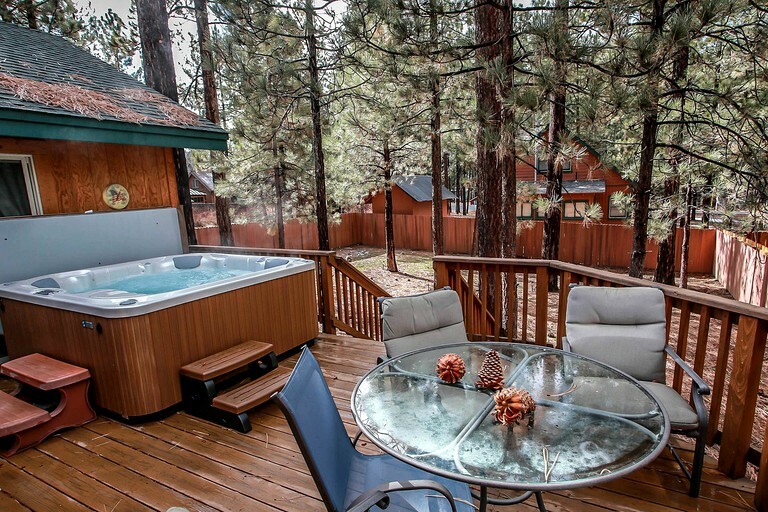 The fenced yard is perfect for pets, children, and adults alike to play games and stay safe. 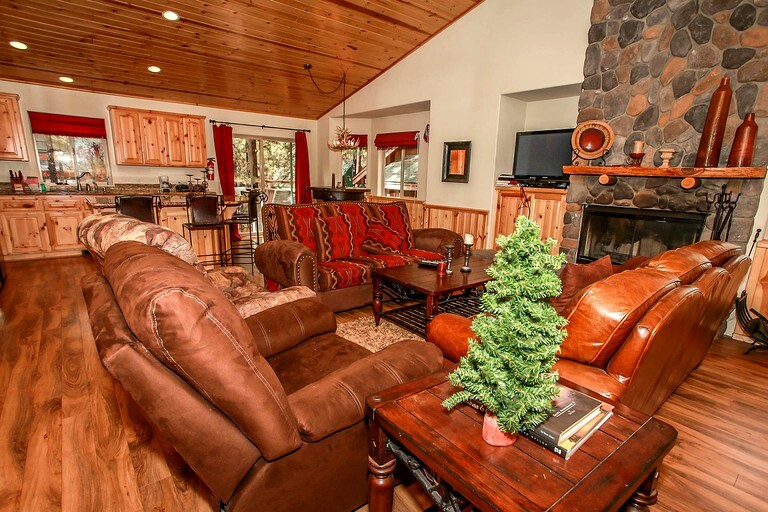 The cabin is ideally situated for winter sports, such as skiing and snowboarding. 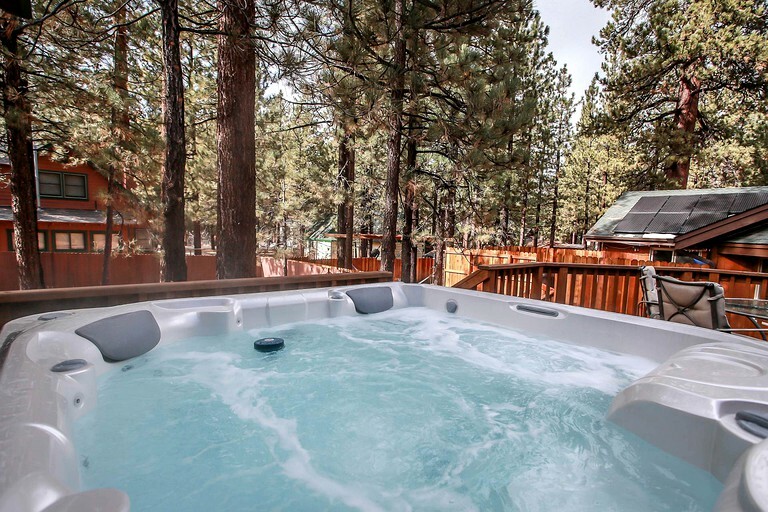 Guests will have their pick from Bear Mountain Ski Resort and Snow Summit Ski Resort, both of which offer incredible downhill skiing, equipment rental, and lessons. Sledding is another fantastic way to enjoy the winter wonderland, and there are gorgeous trails on which to snowshoe and take in the scenery. 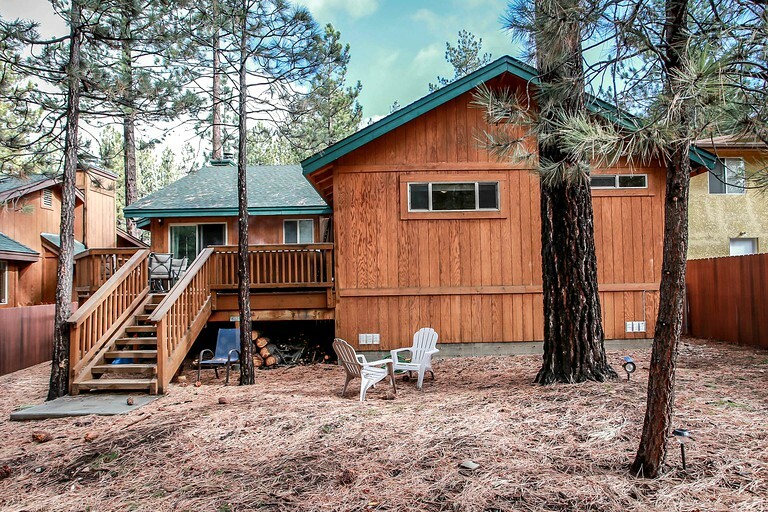 The summer is just as incredible, with sparkling Big Bear Lake ripe for kayaking, paddleboarding, canoeing, sailing, jet skiing, and even parasailing. 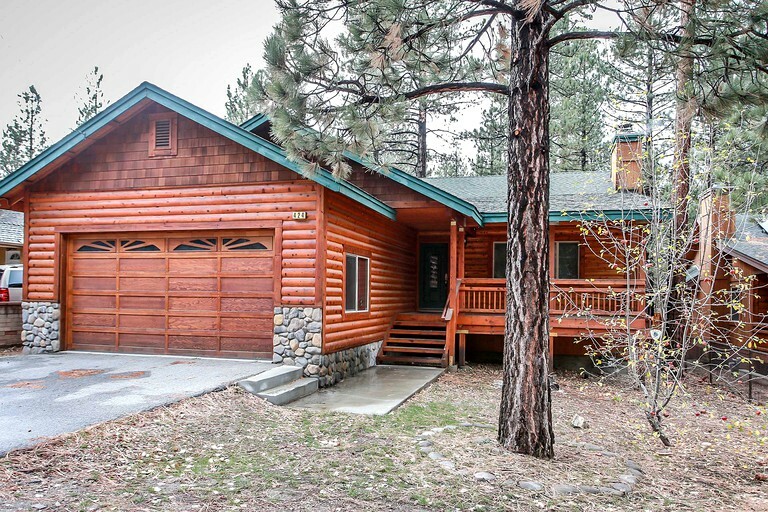 Guests can also take to the San Bernardino National Forest for mountain biking and stunningly beautiful hiking trails. Horseback riding, ziplining, and visiting Boulder Bay Park are just a few examples of the endless activities that are available any time of year. There is no wrong time to visit. 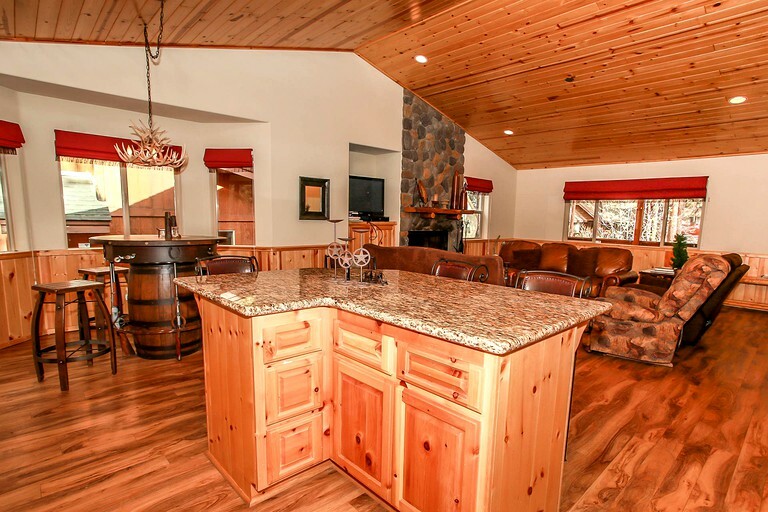 Back at the cabin, glampers will love relaxing in front of their wood-burning fireplace with a good book after a day filled with adventure. Pets are permitted for an additional nightly fee per pet. 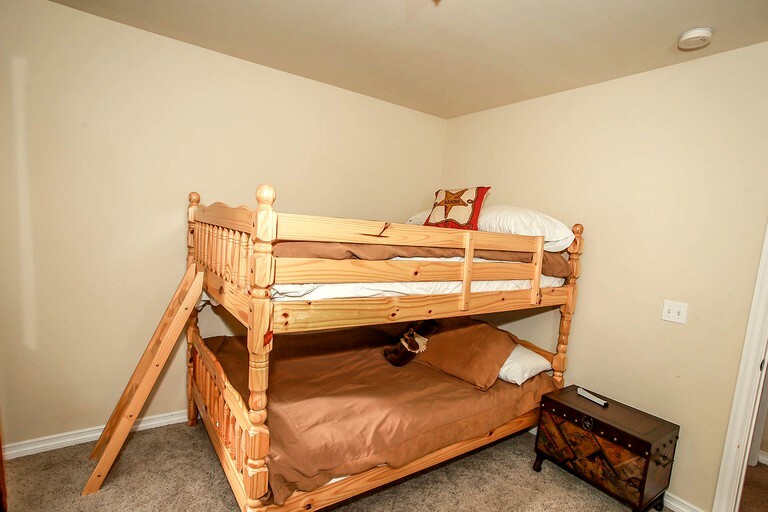 Guests must be 25 or older to rent. A cleaning fee and a tax apply. 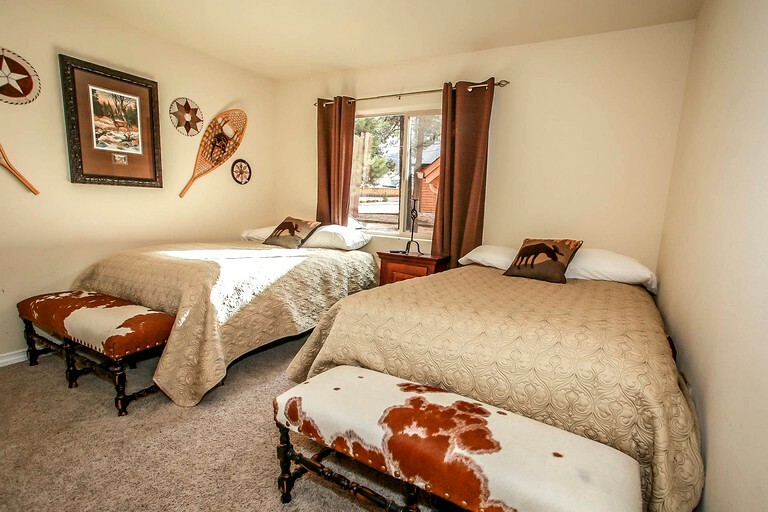 Occupancy is limited to the number of guests included in the reservation. No gatherings or events are allowed without prior approval.